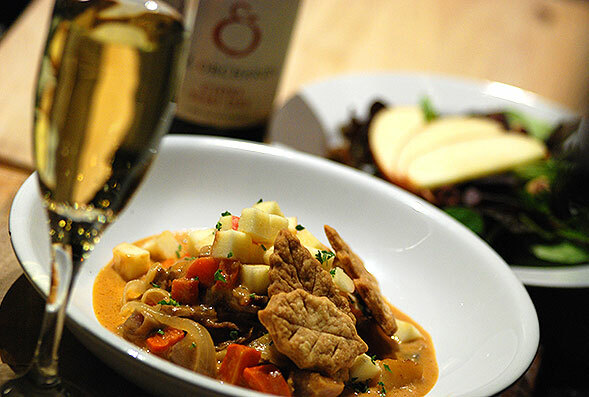 On January 23, we are hosting a special dinner highlighting produce and hard cider by E.Z. Orchards. Cider-maker Kevin Zielinski will attend the event and give a brief talk about his family orchard and their most recent venture, hard apple cider. We're preparing a four course dinner centered around E.Z. Orchards pears and apples, paired with three sparkling ciders, followed by their new apple dessert wine. The cider pairings are included in the meal price for guests 21 and over. The dinner begins at 5:30pm on Saturday, January 23. Tickets are $45 per person, plus 18% gratuity. Advance payment is required to secure reservations. Please call 503-580-2936 to reserve your seats. We look forward to serving you!